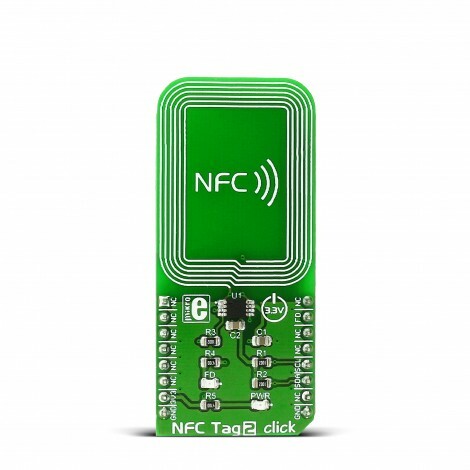 NFC Tag 2 click carries the NT3H2111 NTAG I2C energy harvesting NFC Forum Type 2 Tag from NXP. The click is designed to run on a 3.3V power supply only. It communicates with the target MCU over I2C interface and the INT pin (field detection) on the mikroBUS™ line. NFC Tag 2 click carries the NT3H2111 NTAG I2C energy harvesting NFC Forum Type 2 Tag from NXP. The click is designed to run on a 3.3V power supply only. It communicates with the target MCU over I2C interface and the INT pin (field detection) on the mikroBUS™ line. 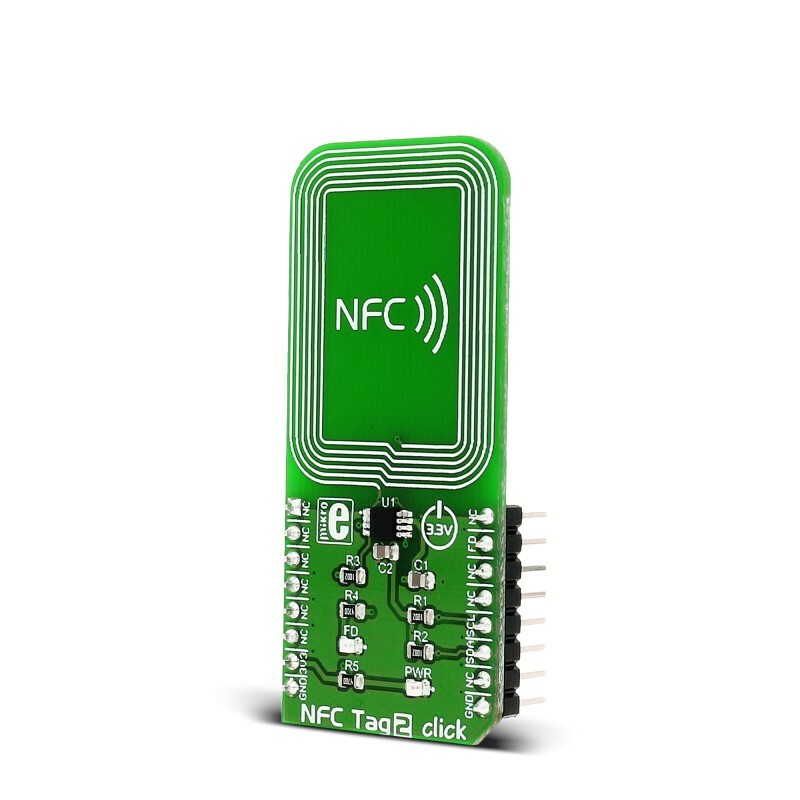 NT3H2111 NTAG I2C - energy harvesting NFC Forum Type 2 Tag with field detection pin. An additional externally powered SRAM mapped into the memory allows a fast data transfer between the RF and I2C interfaces and vice versa, without the write cycle limitations of the EEPROM memory. The FD (field detection) LED is turned ON when an NFC field is detected. Power is generated from the RF field of an NFC device. 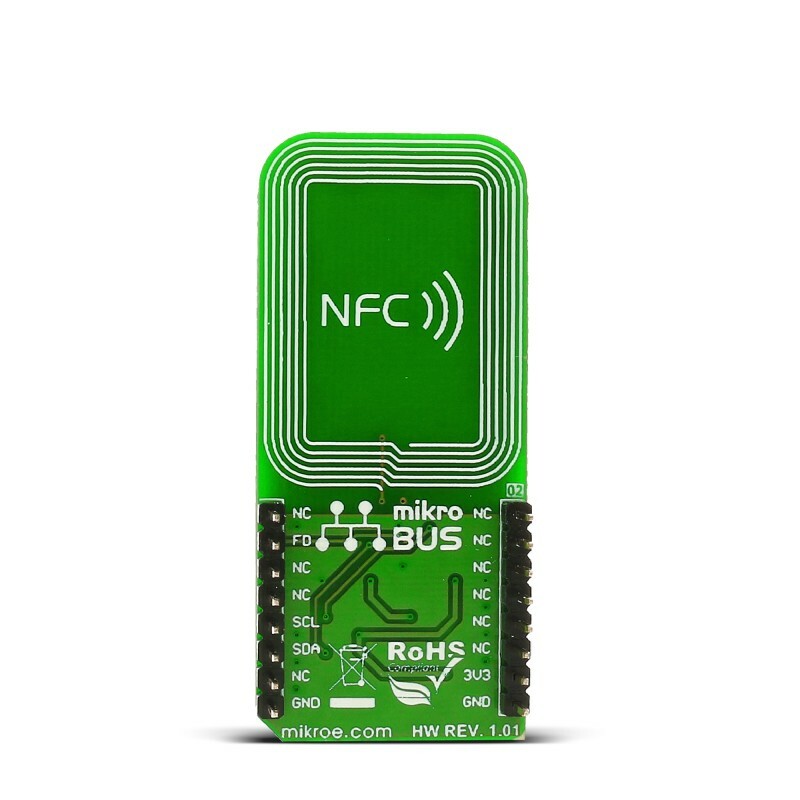 For example, the NFC Tag 2 click can be powered by your mobile phone. This eliminates the need for an external power supply or a battery. At room temperature, NT3H2111 NTAG I2C could provide typically 5 mA at 2 V on the VOUT pin of NT3H2111 which is attached to the FD LED. The NT3H2111 NTAG I2C which can be found on NFC Tag 2 click is the first product of NXP’s NTAG family offering both contactless and contact interfaces. 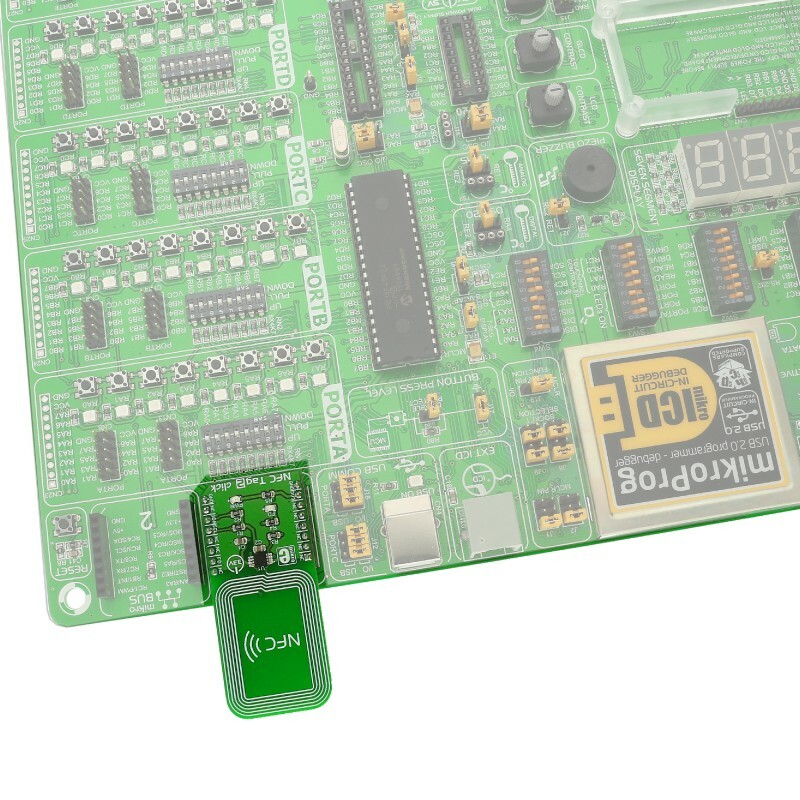 In addition to the passive NFC Forum compliant contactless interface, the IC features an I2C contact interface, which can communicate with a microcontroller if the NT3H2111 NTAG I2C is powered from an external power supply. NFCWorld+ keeps an up-to-date, accurate and exhaustive list of NFC-supported phones. This table shows how the pinout on NFC Tag 2 click corresponds to the pinout on the mikroBUS™ socket (the latter shown in the two middle columns). LD1 PWR LED Indicates the power is on. LD2 FD LED Field Detection indication. Code examples for NFC Tag click, written for MikroElektronika hardware and compilers are available on Libstock. This code snippet demonstrates the writing of an NDEF message on NFC Tag 2 click.